Let’s give it a try. Each week, I’ll write about something I’ve eaten. Maybe it’ll be something I’ve cooked, maybe it’ll be something from a restaurant, but it’ll definitely have been on a plate (or in a bowl) in front of me. For this debut edition of Summer Ate Something, let’s talk about roast chicken. Also mac & cheese. On Sunday evening, I happened upon this article on Taste Cooking. 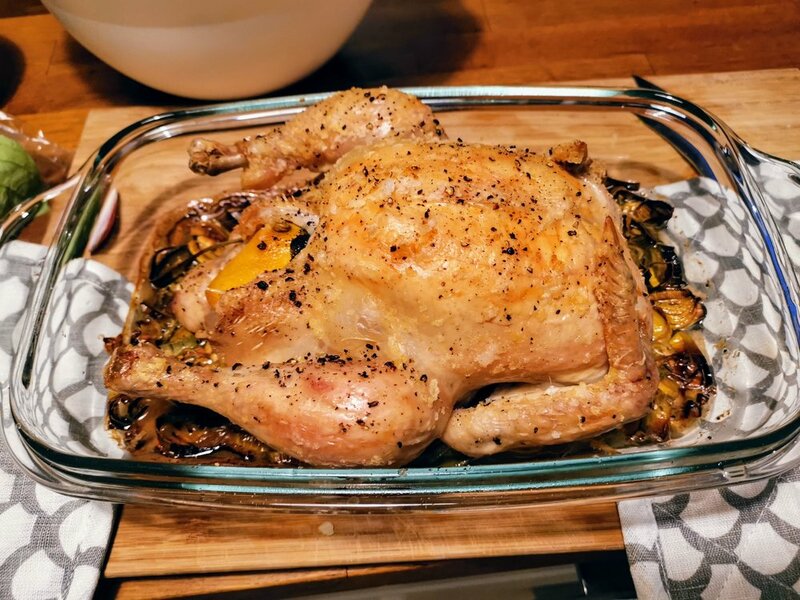 It’s from May 2018 so I’m not sure how I came across it in the first place, but I read it and found myself seduced by the allure of a slow-roasted, minimally prepared chicken. I made plans to acquire a bird. Then I started thinking about the nduja hanging out in the bottom of our fridge. If you’re not familiar with this absolute treat of a pork product, nduja is a soft, spicy, spreadable salami. Italy has given the world many gifts and nduja is among the finest of them, for which we give thanks to the southern region of Calabria. I’ve not been to the “toe of the boot” just yet, but it’s definitely going to happen and I will eat everything. Anyway. So I was thinking about nduja, I knew I had a mostly intact wedge of Västerbottensost that I wanted to do something more inspiring with than just eat on crispbread with sliced cucumber (which is great, btw), so I drew from the inspiration of our recent London trip where we’d found and savored every last morsel of a (an? this word is special) nduja mac & cheese we found at a pub, and the question of what to serve with the poulet rôti was sorted. I seasoned with nothing more than a decent olive oil, flaky salt, and black pepper. 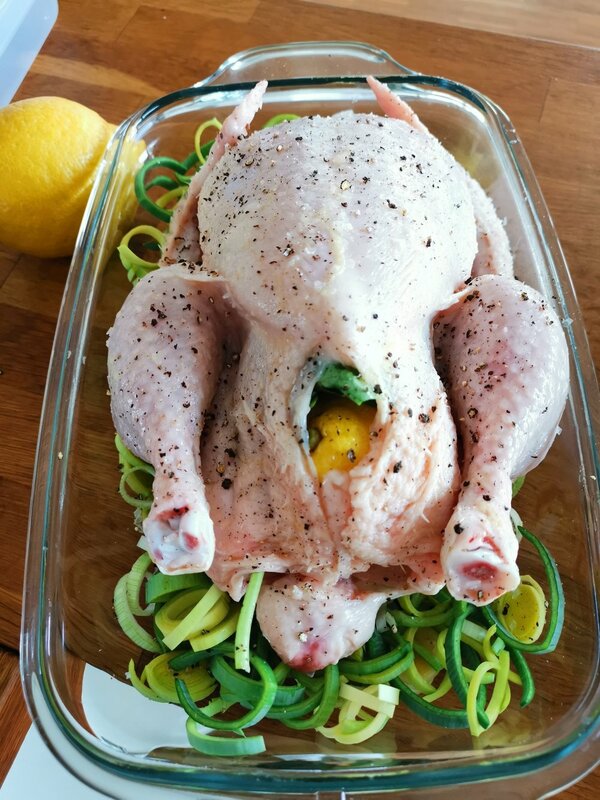 I stuffed a lemon and a handful of torn basil leaves into the bum, plopped our friend onto a bed of sliced leek, slid it into the oven and pretty much ignored it until enough time had elapsed that I knew there was no way it wasn’t done. Looks like a poorly lit disaster; tastes like cheesy, spicy, porky bliss. You can also see a glimpse of my “carved” chicken back there, a term I use loosely as the meat was so tender it kind of fell apart in places during the process. Glorious. Actually, here’s a hasty table shot before we tucked into the feast. You’ll look at the salad thinking it’s a cursory addition and you’d be correct, except for the banging mustard vinaigrette that so nicely complemented both the simple chicken and the zesty pasta that I made another batch of it for my lunch of leftovers the next day. Thus concludes the first installment of the utterly compelling Summer Ate Something series. Not so tough, really… Maybe I can keep this up!